This set of 6 Gold Leaf or Golden Foliage -- sometimes called Starlyte -- cordial glasses have a frosted band with gold leaves around the middle and the clove or cordial stem. They were made by Libbey Glass sometime around the 1960s. 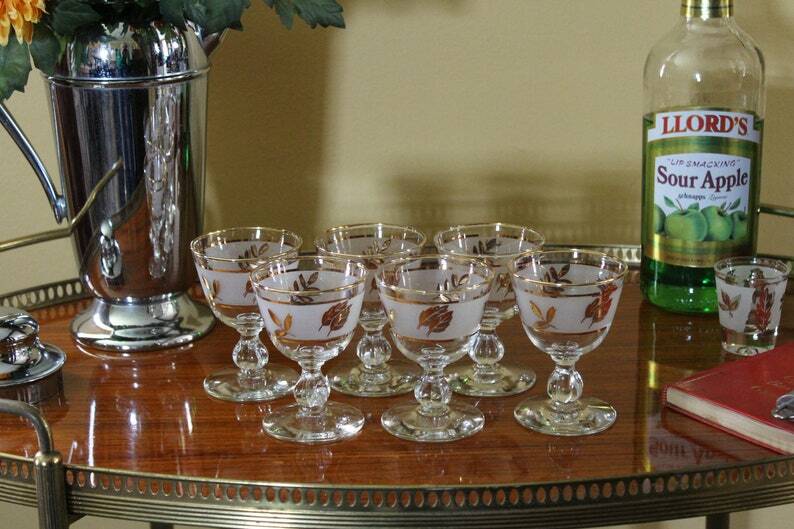 These midcentury cocktail glasses are perfect for liqueurs, brandy, or as we like in our house, they're perfect for a little Fireball. They would look pretty on your retro bar cart. These Golden Foliage cordials are in excellent vintage condition. Please use your zoom for a good look. They hold about 3 ounces.